Silvia is from Liguria, she is living in London since 2010. She is mother of two, designer, prop stylist, food photographer and blogger at Salvia+Limone. She earn the accreditation as Macrobiotic chef in UK. 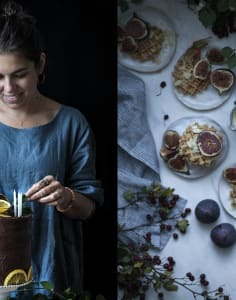 She is known for her Boutique Vegan Cakes with natural unrefined ingredients, that she makes for magazines and weddings. She works for brands and privates as food stylist and chef. She also holds vegan supper-clubs in London.